William Shakespeare’s Long Lost First Play (abridged) is the literary holy grail: an actual manuscript in Shakespeare’s own hand showing all his most famous characters and familiar speeches in a brand-new story. But because it’s one hundred hours long and contains multiple unwieldy storylines, the RSC decides, as a public service, to abridge it down to a brief and palatable ninety minutes and perform the world premiere of this lost masterpiece. 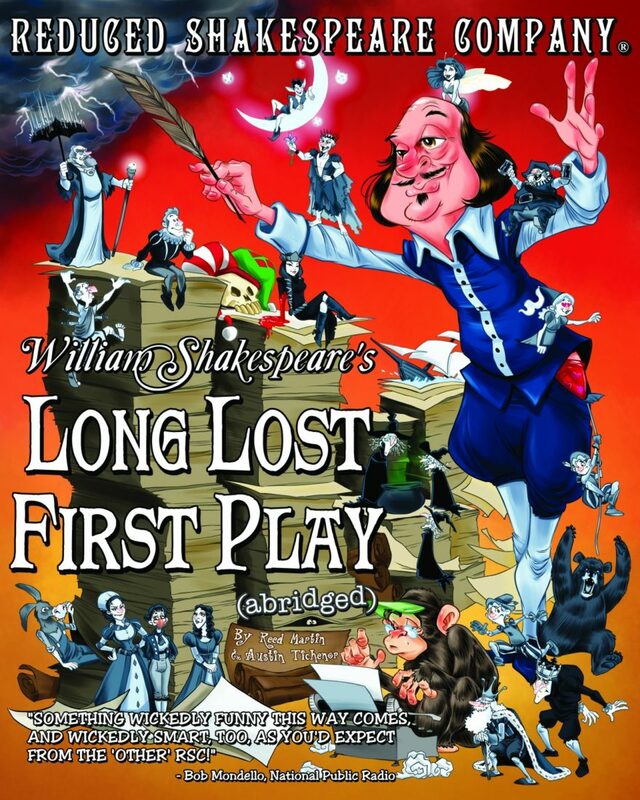 You haven’t seen the Complete Works until you’ve seen William Shakespeare’s Long Lost First Play (abridged)! In this strange-yet-familiar narrative, an ancient grudge pits Puck (from Midsummer) against Ariel (from The Tempest) and turns Shakespeare’s canon upside-down, creating such strange bedfellows as Hamlet and that master motivator Lady Macbeth, Viola and Richard III, King Lear and the Weird Sisters, and (of course) Dromio and Juliet. 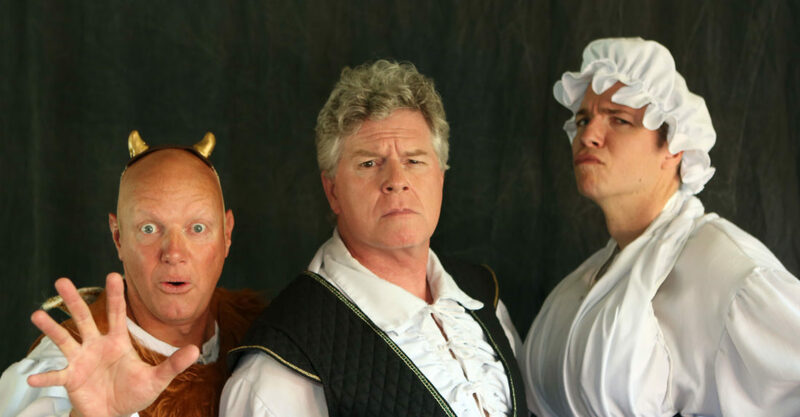 Using questionable scholarship and street-performer smarts, playwrights Reed Martin and Austin Tichenor weave together most of the famous speeches and plot devices of Shakespeare’s thirty-nine plays to create a fast, funny, and fictional fortieth, filled with witty wordplay and vaudevillian variety. There’s method in their madness as the “Bad Boys of Abridgment” reduce this 100 hour masterpiece into a ninety minute minimum opus filled with ancient grudges, mistaken identities, unsettled ghosts, magical spells, questionable potions, powerful tempests, devastating shipwrecks, men dressed as women, and twins twins twins! Watch Reed Martin & Austin Tichenor present their discovery to the experts at the Folger Shakespeare Library! If you like Shakespeare you’ll like the show. 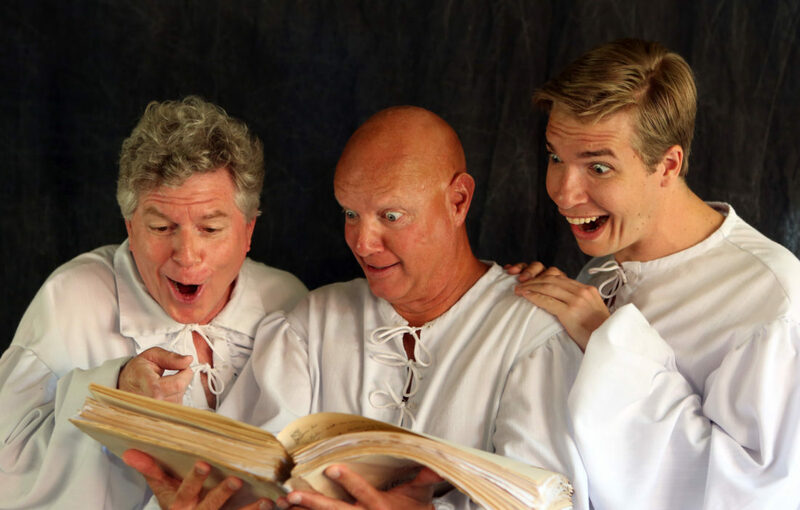 If you hate Shakespeare, you’ll love William Shakespeare’s Long Lost First Play (abridged)! Thank you for coming…and thank the missus too!! Amazing show at the Reston Community Center, 4/22. Tix were a wonderful birthday present from my missus. She knows I loves me some abridged Shakespeare! Saw it at Sale Waterside Wed 22nd March. There were only a couple of scenes that caused mild amusement, however, the rest of it was absolutely laugh out loud funny. Slightly different than most previous offerings but retained all RSC’s brilliant perspective and outrageous presentation. A must for R(educed)SC fans and newcomers alike. Front row seats at Salisbury Playhouse this evening. Brilliant evening’s entertainment and very educational. Who’d have thought Shakespeare, Disney, Dickens and Rowling could be woven together. Absolutely brilliant. Saw it at Chipping Norton Sat 11th 17. Haven’t laughed so much for a ongoing time. Amazing actors. DI not miss it. Hmm…doesn’t sound like us. We didn’t come to the UK until 1987. Please contact Broadway Play Publishing (check our Contact Page for details). They’ll be able to best answer that question. Can I do a derivative work of your play “the complete works of william shakespeare (abridged)” with latin-based quotes and Roman characters for an amateur, small performance? Thanks for your interest, Pam! The script for LongLostShakes won’t be available for amateur licensing for several years, but most of our other shows are. You find them at our publisher’s website https://www.broadwayplaypub.com. Thanks for your interest! Please can you tell me if it is possible to get this script for amateur performances.